Morning, all. A group with ties to Mitch McConnell is pushing back against the "repeal first" crowd, Republicans are slogging their way through more Obamacare questions at town halls, and a new patient group is being launched to take on high drug prices. 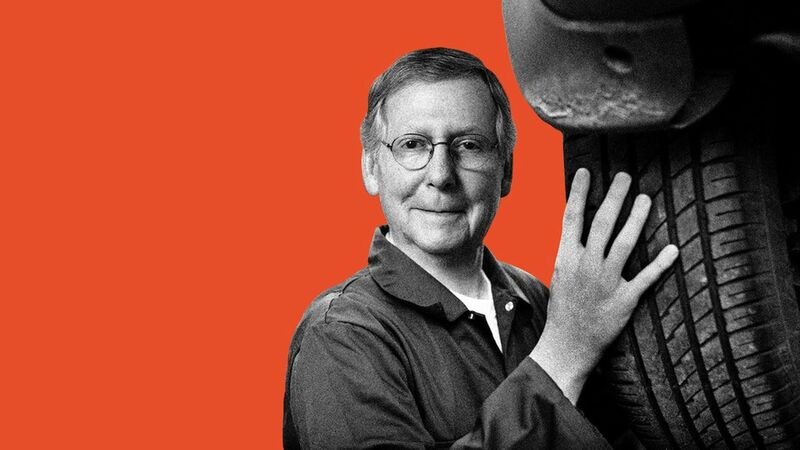 Jonathan Swan got a great scoop about a new ad campaign and poll by One Nation, a political advocacy group that's linked to Senate Majority Leader Mitch McConnell. The message of the ad campaign: It's "repeal and replace," not just "repeal." And the poll, which they're going to be circulating on the Hill over the next few weeks, really drives that point home — because most Republicans want Obamacare to be replaced too, and right away. But here's something I noticed: The ad campaign spends a lot of time talking about Obamacare's high out-of-pocket costs, especially the rising deductibles. And that part is true — except it's also true of employer health coverage throughout the country. Democrats are owning that problem right now because they overpromised with the Affordable Care Act — they made it sound like the law would make health care, you know, affordable. But if Republicans make the same promise and don't deliver, they'll own that, too. Read our story here. The big decision in the House Republicans' Obamacare lawsuit yesterday was a bit of a downer: The House just asked for a three-month extension. That's the lawsuit challenging the payments the Obama administration was making to insurers for their cost-sharing reduction subsidies to low-income people. It's more awkward now that the Trump administration is in charge, since Republicans don't really want to be suing each other. Caitlin Owens has more here. Between the lines: The motion suggests the two sides are working toward a "resolution" that would eliminate the need for further court battles. Could that be the signal that Congress will pay the cost-sharing subsidies? There hasn't been any official word that Congress will do it, but when even hardline conservatives like Freedom Caucus chairman Mark Meadows say they'd be OK with it, it's no longer an unthinkable solution. Insurers get an extension: And as the ever-helpful Timothy Jost notes at the Health Affairs blog, insurers just got an extra six weeks to decide whether they'll offer coverage in the Obamacare marketplaces next year. The new deadline is June 21. There's a new advocacy group joining the fight against rising drug prices. Patients for Affordable Drugs, founded by David Mitchell, a former partner at the political consulting firm GMMB, launches today to tell stories of patients struggling with high drug costs and push for federal and state legislation. Mitchell is fighting multiple myeloma, a blood cancer that costs $26,000 a month to treat. He'll have help from Ben Wakana, the executive director, who was a Department of Health and Human Services spokesman in the Obama administration. The twist: You'd think there were a ton of patient groups on the case already, right? Not really — most of the fight has been coming from industry group coalitions like the Campaign for Sustainable Rx Pricing. Mitchell says many of the patient advocacy groups are too compromised by funding from the drug industry or pharmacy benefit managers. So he's avoiding those funding sources and starting his group with a $500,000 grant from the Laura and John Arnold Foundation, and he and his wife are kicking in $75,000 of their own. "We have a constituency that hasn't been tapped," said Mitchell. "We'll be able to play." Today's clickbait: Accountable care organizations! "But wait, my coffee isn't strong enough," you say? Don't worry, we'll walk you through it. A new post by the consulting firm Avalere notes that accountable care organizations — networks of doctors and hospitals that work together to deliver medical care more efficiently — are accepting more risk. A growing number are taking on "two-sided" risk, which means they might get bonus payments from the federal government, but they'd also have to repay any losses if they don't save money. This year, 87 of the organizations are accepting two-sided risk, up from 49 last year. Why it's happening: Avalere's John Feore, the author of the post, told me it's happening mostly because health care providers are becoming more comfortable with the program. But he said there's also another incentive to take on more risk: Under MACRA, the Medicare payment reform law, those organizations get bonuses and don't have to do all of the quality reporting that other providers will have to do. $350 million. Buyer: AbbVie. Seller: United Therapeutics. $245 million. Buyer: Sanofi. Seller: Retrophin. $125 million. Buyer: Gilead. Seller: Knight Therapeutics. $67.5 million. Buyers: Regeneron Pharmaceuticals and Sanofi. Seller: BioMarin. the U.S. launch of the drug. What we're watching: National Governors Association winter meeting, Washington, Feb. 24-27. And, of course, more town halls. And that's it! Keep in touch and let us know what we can do better: david@axios.com.